Ashley is PolishAddicted: Nail It Magazine Features Zoya Nail Polish Online! Nail It Magazine Features Zoya Nail Polish Online! “As if the gorgeous shades and lovely shape of the lacquer bottles weren’t enough for us to go gaga over Zoya nail polishes, this nail polish brand was the pioneer of the “3 Free” effort. Three-free means that three ingredients are absent from the nail polish formula: toluene, formaldehyde and dibutyl phthalate (DBP). 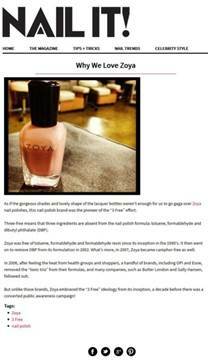 Zoya was free of toluene, formaldehyde and formaldehyde resin since its inception in the 1990's. It then went on to remove DBP from its formulation in 2002. What’s more, in 2007, Zoya became camphor-free as well. 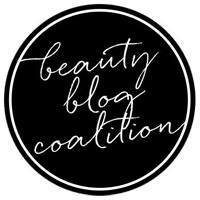 In 2006, after feeling the heat from health groups and shoppers, a handful of brands, including OPI and Essie, removed the “toxic trio” from their formulas, and many companies, such as Butter London and Sally Hansen, followed suit. In fact, Zoya Nail Polish remains committed to providing a healthier choice in beauty with a formula that is also free of formaldehyde resin and camphor, making each and every long-wearing, beautiful shade Big5Free. CONNECT WITH ZOYA: To alert our social media department of your Twitter, Instagram and Pinterest posts make sure to tag us @ZoyaNailPolish and hashtag posts with #ZoyaNailPolish and #ZoyaBig5Free. Website, Blog and YouTube links can be shared on our facebook page (http://www.facebook.com/zoyanailpolish).